Close to Sinterklaas, we have beautiful, real dutch geocoins: the Take a Bite 'Dutch Golden'. Maybe, you've seen this one already on our website: the Troy Geocoin samples. The result is really great. The produciton has started already, but it is still possible to reserve some coins. We deliver everything which is on our website from stock, which means, if you order and pay before 16.00 CET it will mostly be shipped the same day. Our updates can also be followed via Twitter: @geocachingshop. Special dutch XLE edition of the Take a bite geocoin. Special Dutch XLE version of the Take a bite geocoin. We choose for the color of "apple-green" and a colored Goundspeak logo on the front. Also the text on the back is colored with the same green enamel. The idea for this coin comes from a Dutch television program called het Klokhuis ("The Core"). The show presents science stories to children and gets to 'the core' of how things work. Saffier's stylized apple core draws inspiration from the show's logo. The yellow enamel and recessed metal lion represent Saffier's home province of Zuid Holland. Next to this version, we have also black nickel LE, two tone gold/silver LE and gold XLE. Have you ever been bushwacking 200 meters through a blackberry bramble before finding the cache -- and the trail. In retrospect the trek wasn't that bad, but it sure felt horrible while I was enduring it! The deerflies were the size of hummingbirds, the thorns made mincemeat of my jeans, and the wildlife (though not dangerous) seemed to be mocking me every step. Available in 3 versions: antique gold, black nickel and blood hound (XLE). Beautiful new version of the Davy Jones Serie, this time in antique gold. This is a little look into the undersea world, from the porthole. The front side has half raised detail of a ship and a skull underneath the translucent enamel. The backside is an old time compass, with half raised distress under the translucent enamel. Special made for all the young cachers, the Kids Caching geocoin. Ride the bus to a new adventure! What's better than an SUV Racer? Well nothing of course. The design of this Hummer geocoin was inspired by Team kizb. It is the H3 Hummer racer but then in a inexpensive version. 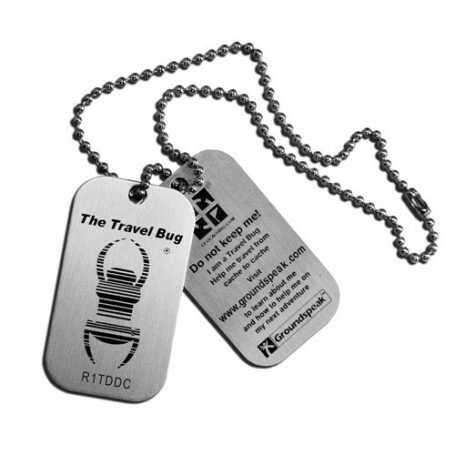 There are different versions of this geocoin, but we have the black nickel / red version. This coin was available earlier, but very quickly sold out. We have now new stock of this XXL verion Mapamundi Geocoin. Size 90mm, 5mm thick and a bronz antique finish. New in the serie of the FarmtagZ, the Goat. You can find this magnet tape in Magnets. You can find this book in Books and magazines. This is a high quality fleece jacket that is extremely comfortable and goes well with just about anything. Whether you are on the trail hunting caches or walking around town, you will feel warm and look cool at the same time. Heavyweight microfleece 440 gram body; wind/water resistant; microfibre peached top.